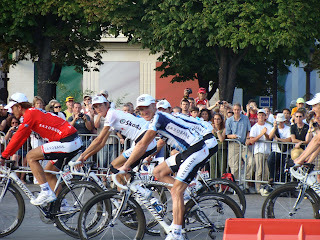 Ian Why, the WCC’s foreign correspondent, files this report back from the Champs Elysees, along with some photos. Sorry I could not make the club run this week. I was in the capital of French France supporting two plucky Brits showing Johnny Foreigner what they were made of. You'll be pleased to know that after three weeks of playing an intense stage racer Mr. Wiggins reverted to type on the parade lap and rode up the Champs Elysees saluting the crowd with a bottle of beer. What a star!!! Cav managed to smile at people waving strange flags with three legs on them! The only disappointment was a certain American who rode the parade lap 100 metres in front of his team surrounded by press motor bikes. No one saw him until he had passed by, disappointing loads of fans, especially the kids. What an ********! He didn't have the hump or anything, much!! 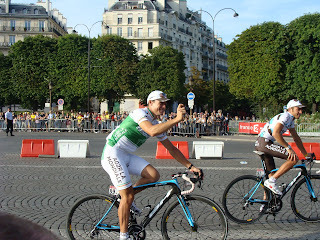 Alberto Contador was behind his team with a smile so wide he could have swallowed the Eiffel Tower side ways!! 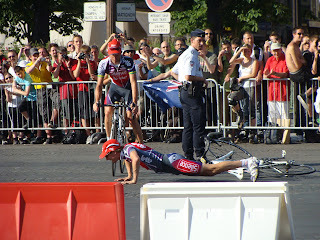 This rider who obviously did not try too hard on the Champs Elysees! Nicholas Roche son of Steven, who had a really good tour.